The bureau’s director, J. Edgar Hoover, was never a fan of these nicknames – he felt they lacked gravitas – and so they were never formalized. However, years later, Hoover would remember them when it came time to protect the secrecy of agents’ locations in certain communications. When the Bureau was renamed the Federal Bureau of Investigation in 1935, it took on an expanded role, including the investigation of strange phenomena. In 1938, the FBI began to look into reports of a “super-powered vigilante” in the San Francisco Bay area. The mission was given the codename “Project Metropolis,” after the 1927 Fritz Lang movie of the same name. “Metropolis” had soon replaced “Apricot” as FBI jargon for the San Francisco field office, and in 1939 J. Edgar Hoover himself officially authorized its use for that very purpose. 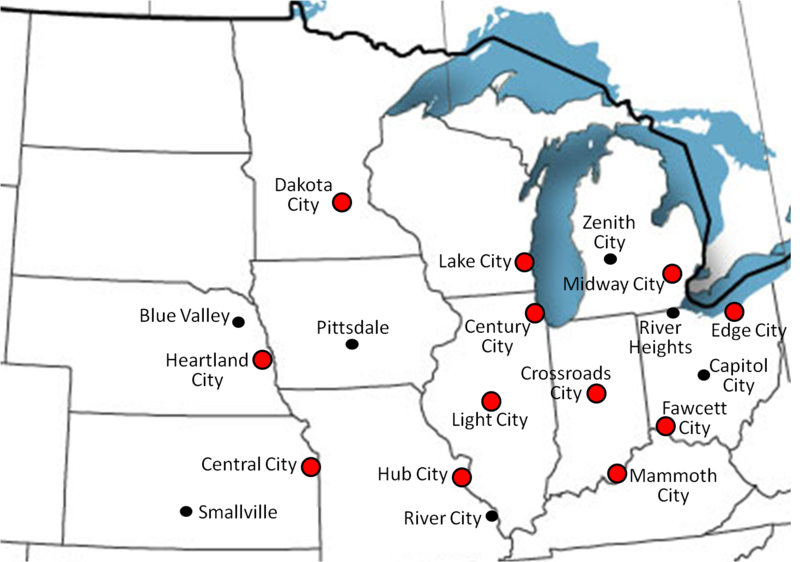 Since that time, many of the FBI field offices have been given official codenames, and those codenames are often used interchangeably for the cities they are based in. Certain other “places of interest” have also been identified by codenames throughout the years. Here is a list of the most common FBI location codenames. 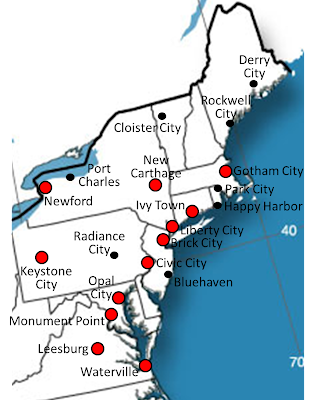 Those associated with primary FBI field offices are marked with an asterisk (*) in the text and highlighted with a red dot on the maps. Note that this is only a partial list. There are locations not listed here that have been assigned official FBI codenames, and some locations may have additional high security level or mission-specific codenames in addition to the general-use codenames listed below. As we all know by now, the original colony of Massachusetts was plagued by supernatural phenomena, of which witches only began to scratch the surface. At that time, the colony included what eventually became the state of Maine, and today you will still find many people in both Massachusetts and Maine who practice “the old ways.” The FBI has identified a variety of strange, occult subcultures in the local population that uses alternate names for locations throughout both states. Here are just a few of the “hotspots” of activity that have been identified (there are many more), along with the alternate names used by these occultists. Home of the Golden Age version of The Atom from DC Comics. One-time home of the Doom Patrol from DC Comics. From It and other works by Stephen King. From the book The Iron Man, made into the film The Iron Giant. From the television program Murder She Wrote. The FBI investigated the abnormally high rate of murders here, but found only coincidence. The home of Starman from DC Comics, located in Maryland. The home of Batman from DC Comics. This is a city that is normally thought of as an analog of New York City, but I made a strong argument that it is really Boston. 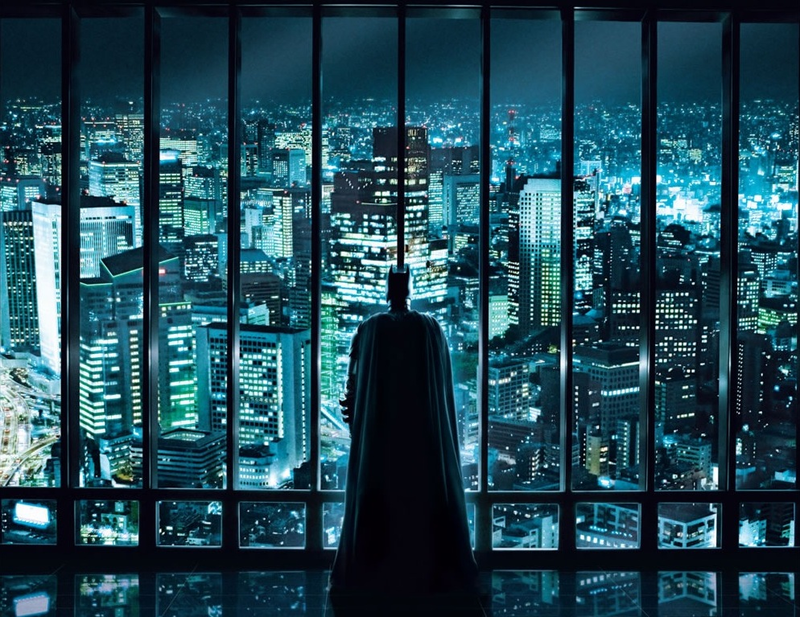 Believe it or not, Gotham City also exists in the Marvel Comics universe. DC Comics has a city named “Blüdhaven,” which is the adopted home of Nightwing. It’s an important city, but a terrible name, so I fixed it. The former home of Black Lightning from DC Comics. It has also become a real-life street nickname for Newark, due to the volume of crack bricks present. From the novels of Charles de Lint. Newford is a U.S. city, but seems to have some Canadian characteristics, so I used it for the border city of Buffalo. The analog for New York City in the video game Grand Theft Auto. The analog for Brooklyn in the video game Grand Theft Auto. The analog for Queens in the video game Grand Theft Auto. From the soap opera General Hospital. Home of the second generation of Blue Boys, sons of the original Little Boy Blue and the Blue Boys from DC Comics. The home of Jay Garrick (the original Golden Age Flash) from DC Comics. The original home base of the Justice League of America from DC Comics. A former home of Black Canary from DC Comics. From a 1945 story in Timely Comics featuring the Sub-Mariner, and a reference to the Hampton Roads waterway. A city in Virginia from DC Comics. Also called Lee City in Timely Comics, the predecessor to Marvel. A Washington, DC analog from DC Comics. From the Green Hornet comics published by Dynamite (other stories place the character in Chicago or elsewhere), and a reference to the 1933-1934 “Century of Progress” World’s Fair held in Chicago. A homage to the soap opera Guiding Light, which is set in a fictionalized version of Springfield, Illinois. The hometown of Lois Lane in DC Comics. The boyhood home of Superman from DC Comics. Timely Comics created a fictional city named Louisville in 1940, but I couldn’t use its actual name as its codename. Instead, I used the original, Golden Age home of Plastic Man in Police Comics, in honor of nearby Mammoth Cave National Park. The DC Comics analog of Detroit. From an obscure city of unspecified location in DC Comics. From the Milestone Media imprint of DC Comics. From a 1976 story in Marvel Comics starring Captain America. This is also a real-life nickname for the city. The home of Denny Colt (Will Eisner’s The Spirit) and of Barry Allen (The Flash from DC Comics). For the former, it was more of an analog of New York City, but for the latter it was definitely Kansas City. From Charlton Comics, and later from DC Comics; originally based on East St. Louis, Illinois. This is my tribute to Dairy Land from the episode “Too Hot to Handle” on the first season of Super Friends (1973). “Dairy City” sounded a little too over the top, but I liked the farm-fresh feel it evoked. The hometown of Wally West (Kid Flash) and the adopted home of Courtney Whitmore (Stargirl) from DC Comics. The home of Billy Baston (Captain Marvel) in DC Comics; a tribute to Fawcett Comics. From The Mask comic book series. Also, you need an edge to “cleave” something. The original home of Alan Scott (Green Lantern) from DC Comics. From the Nancy Drew book series. An obscure city from Timely Comics, the predecessor to Marvel, and a fitting name given the city’s location on Lake Michigan. From an obscure 1940 story in Timely Comics, the predecessor to Marvel, starring the robot Electro. 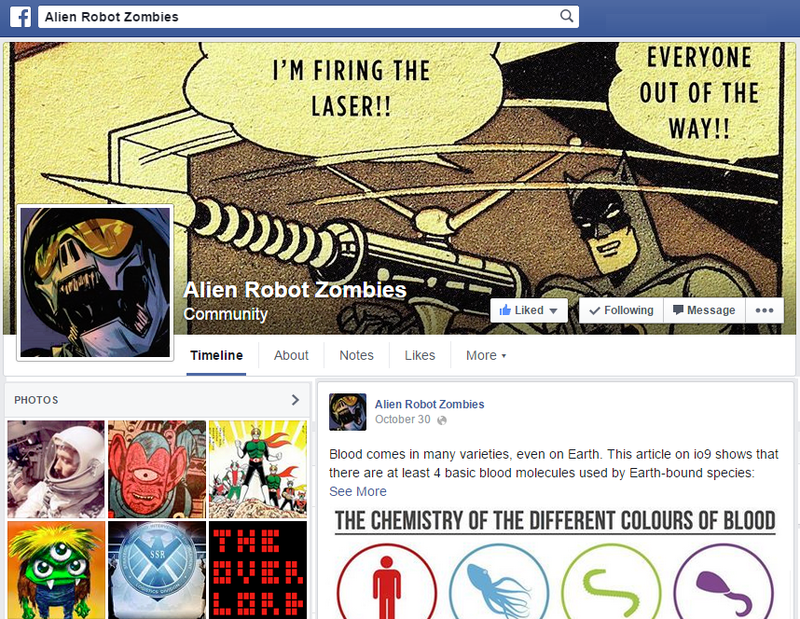 From DC Comics, named as a tribute to Charlton Comics. An obscure city from Timely Comics, the predecessor to Marvel, and a play on the city’s name. The DC Comics city where Cliff Steele crashed in an auto race before he became Robotman. 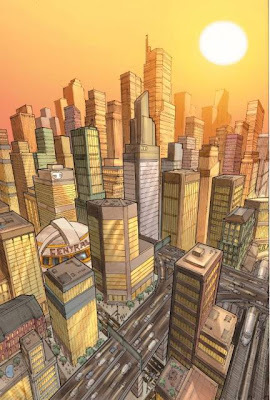 A city in Florida from DC Comics. The analog for Miami in the Grand Theft Auto video game series and a tribute to the television series Miami Vice. A vacation destination city from Timely Comics, the predecessor to Marvel. 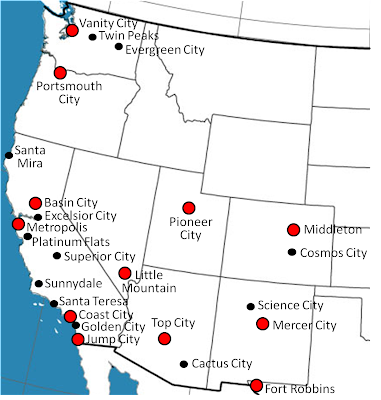 DC Comics has Gateway City located in California, where it is an obvious analog of the San Francisco Bay area, but it works just as well as an analog of the Tampa Bay area in Florida. The DC Comics analog of New Orleans. The mutant Rogue (Anna Marie) from Marvel Comics grew up in Caldecott County, Mississippi. A reference to the city’s official nickname, the Queen City, as well as its status as a center of finance. The Golden Age name in Marvel Comics (then known as Timely Comics) was Finance City, but I just couldn't bring myself to perpetuate that one. Delta City is minor setting in DC Comics, home of the Heckler. The location is unspecified, but the Research Triangle area seemed a natural fit. An obscure city from Timely Comics, the predecessor to Marvel. The home of Resurrection Man from DC Comics. From an obscure city in a 1941 story in Timely Comics, the predecessor to Marvel. There is an Empire City in DC Comics, but it is in Massachusetts. I chose the name for Memphis, because Memphis was named after a city in Egypt (home of an ancient empire), and it was also the home of Elvis Presley (the “King of Rock and Roll”). From an obscure city in Timely Comics, the predecessor of Marvel. Home of the Trigger Twins (Walt and Wayne), an Old West duo from DC Comics. An obscure city name from DC Comics, home to the Golden Age hero Little Boy Blue. It does not appear that Little Boy Blue was from Texas, but it seemed like an appropriate name for the capital of the state where everything is bigger than life. The Southfork Ranch on the television show Dallas was located in the fictional Braddock County, Texas. The home of Tom Strong from America’s Best Comics. This is kind of a futuristic sounding name, which evokes Houston’s actual nickname, Space City. The home of El Diablo from DC Comics. In Spanish, “Dos Rios” means “Two Rivers.” San Antonio is really only famous for one river, so who knows what the FBI was thinking? As in “tabletop,” a reference to “mesa.” There is a “Mesa City” in DC Comics, but I didn’t use it because there’s an actual Mesa, Arizona, which is a suburb of Phoenix. From an obscure 1948 story published by Timely Comics, the predecessor of Marvel. From a variety of different sources, starting with the 1955 novel The Body Snatchers. The home of the Red Bee from DC Comics. The home of Barb Wire from Dark Horse Comics. The home of Hal Jordan (Green Lantern) from DC Comics. Coincidentally, Coast City also exists in the Marvel Comics universe. The name of the Los Angeles analog from the video game Grand Theft Auto: San Andreas. The home of Oliver Queen (Green Arrow) from DC Comics. There is also a Star City mentioned in the Marvel Comics universe. Traditionally one of the boroughs of Metropolis. Traditionally one of the boroughs of Metropolis in DC Comics, and the home of Jimmy Olsen. From Dark Horse Comics. In the comics, that city is in far northern California, but the name works really well for Orange County. 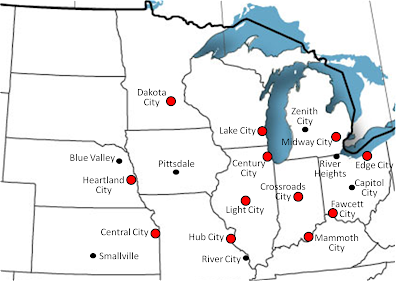 Although there are several cities here, the name is used for the entire county. An obscure city from a Captain America story published by Timely Comics, the predecessor of Marvel, in 1942. The city that this codename was originally used for was entirely destroyed in that incident, but the FBI codename has now been extended to the entire “Inland Empire” area, the densely populated regions of Riverside and San Bernardino Counties. The central city of Frank Miller’s Sin City comic book series. Traditionally the central borough of Metropolis. The DC Comics analog of Silicon Valley. From Buffy the Vampire Slayer. An analog of Santa Barbara from the mystery novel The Moving Target by Ross Macdonald; also used subsequently in several mysteries by Sue Grafton. Traditionally a section of Coast City in DC Comics. Before it was incorporated as a city, most of the communities in the Santa Clarita Valley began as part of the historic Rancho San Francisco. The valley is between Los Angeles (a.k.a. “Coast City”) and Edwards Air Force Base and would be a logical home base for Hal Jordan, the most well-known Green Lantern. This was the original home of the Fantastic Four in Marvel Comics. It was known as Central City, California in those days, but we already have a Central City in Missouri. “Excelsior!” is the catch phrase of Fantastic Four co-creator Stan Lee, and the term was later introduced as a project name in a re-telling of their origin story. Originally used by DC Comics for a city in Oregon, but I used it here to honor Pearl Harbor. A literal English translation of “Montecito,” the name of a fictional casino that appeared in two NBC television series: Heroes and Las Vegas. Mercer is the name of a fictional western U.S. state in the cult movie Motorama. The DC Comics analog for Portland, Oregon and the home of Dr. Mid-Nite. This was originally used for an Old West town in Arizona in Marvel Comics, but it works just as well for Utah. The home of Aztec from DC Comics. It is usually placed in the state of Oregon, but I think it is a better fit for Seattle. From the television series Twin Peaks. In DC Comics, this area was the home of Hal Jordan (Green Lantern) for a while. 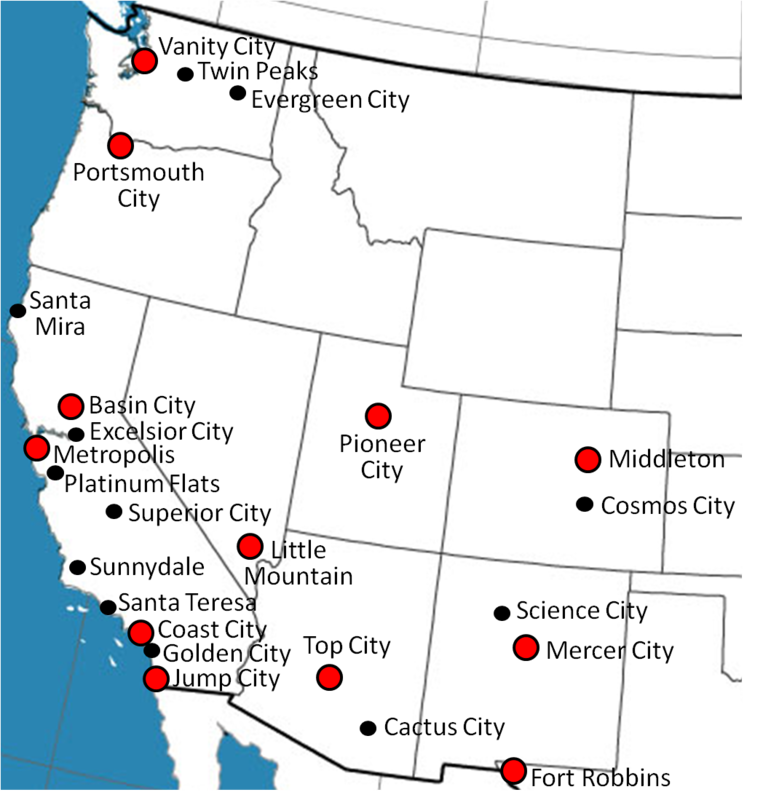 At one point, the entire “bedroom community” town of Cheney, Washington, a few miles away, was temporarily relocated to the planet Oa. It has since been returned. From Salem’s Lot and other works by Stephen King. From The Dead Zone, Cujo and other works by Stephen King. From the writings of H.P. Lovecraft. Finally, note that Salem Center, home of the X-Men in Marvel Comics, is not a fictional town, although it is often mistaken for one. It is in fact a hamlet within the real-life town of North Salem, New York.